Hi-res audio for gaming and music? Now DAC’s entertainment. If your budget doesn’t stretch that extra $50 for the wireless version, you won’t find a more complete package for 250 bucks. High-resolution audio is PC gaming’s favorite “Next Big Thing” at the moment. Just as HD displays brought our eyes out of the dark ages and into a new era of crystal-clear game worlds, hi-res audio wants to bathe your ears in newfound fidelity, making positional audio cues in games easier to pinpoint, and Metallica’s Master of Puppets sound exactly 3.8 times more badass than the last time you heard it. And it’s this promise that SteelSeries embraces with its newest batch of Arctis headsets. They were already among the best gaming headsets in the market, and now a trio of fresh (and expensive) models aims to stretch out that lead on the competition. There’s always room for a little healthy cynicism when these new tech standards present themselves, of course. 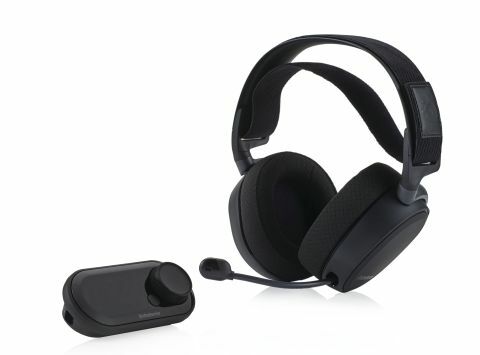 But what we’ve seen elsewhere from hi-res headsets, such as Roccat’s Khan Pro AIMO, is that even if you’re not listening to 24-bit sound, and thus capitalizing on the tech, the sound quality is still wonderful. Like that Roccat headset, the Arctis Pro + GameDAC features a frequency response range of 10Hz all the way up to 40kHz, way beyond the usual 20-20 we see from non-hi-res cans. And that means that even if you don’t have a Tidal subscription to deliver lossless songs into your ears at the press of a button, you do hear an improvement in sound quality thanks to that wide range. Best of all, that improvement is coming from the GameDAC box, a digital-to-analog converter and amplifier that takes processing duties away from your PC and handles them in the middle of the signal path. SteelSeries’s GameDAC, which is small and unobtrusive enough to sit on any desk, also doubles up as the control center. Pressing the larger black rubberized dial brings up an OLED options menu, where you can turn DTS Headphone: X surround sound on and off, tweak game/chat volume balance, and more. As with previous Arctis models, there’s a volume scroll wheel at the back of the left earcup, and an easy-to-find mic mute button above it. However, on the wired version I've tested, there’s no game/chat balance scroll wheel on the right earcup, and as a veteran Arctis 7 user, I feel that loss. It’s inherently more tricky to set it using the GameDAC. Another minor gripe is that since the headphones connect to the GameDAC via micro-USB, you need to hook up the supplied 3.5mm mobile adapter if you want to use the headset (minus hi-res support) with your smartphone. And since recent smartphones ditched the 3.5mm jack, that means attaching yet another adapter, and walking around looking like a meme. Not really SteelSeries’s fault, but worth bearing in mind if you’re considering this as an all-in-one solution. And it is very tempting to see the new Pro version of the Arctis as just that. It’s PS4- compatible as well as PC, though not Xbox without jumping through some hoops. Visually, the beautiful clean design hasn’t been trodden on by the inclusion of RGB lighting—it’s a subtle ring around each earcup that looks as good as we’ve seen any RGB product look. As a gaming headset, it’s feature-rich and brilliantly tuned with the sometimes divisive Headphone: X software-based surround sound, creating rich and spacious soundscapes. As a pair of audiophile headphones, it really does have the warmth and depth to compete with more expensive, non-gaming models, albeit with a chain of adapters in tow if you want to hook it up to a smartphone. This wired Pro model isn’t the cream of the new Arctis crop—that honor belongs to the more expensive wireless version (our high-end pick for the best wireless gaming headset), which also includes a chat mix scroll wheel on the headset, and the ease of use that a wireless setup brings. But if your budget doesn’t stretch that extra $50, you won’t find a more complete package for 250 bucks.